Is nuclear power making a comeback? After being battered by its own missteps, near-calamities, strong opposition and financial overruns, the nuclear power industry is showing increased signs of emerging from a three-decade coma in the U.S. Many are giving a second look to the U.S.. nuke industry, including longtime skeptics on the lookout for alternatives to fossil fuels. Here at SEJ's annual conference, there's a livelier-than-usual discussion about nuclear power as a part of the solution to America's energy woes. One of the most prominent voices here calling for a nuclear power revival was R.K. Pachauri, who as Chair of the Intergovernmental Panel on Climate Change shared the Nobel Peace Prize with Al Gore last year. Right now, the U.S. gets just under 20% of its electricity from nukes, and about half from coal. Natural gas is good for nearly another 20% of energy generation, with oil, hydro, wind, and solar contributing most of the last 10%. To listen to the rosy projections a half century ago, nuclear would have provided power "too cheap to meter" from over 400 reactors by the year 2000. We topped out at just beyond 100 reactors total when Wall Street got cold feet from the risk, the opposition, and the above-average costs of boiling water by splitting atoms. 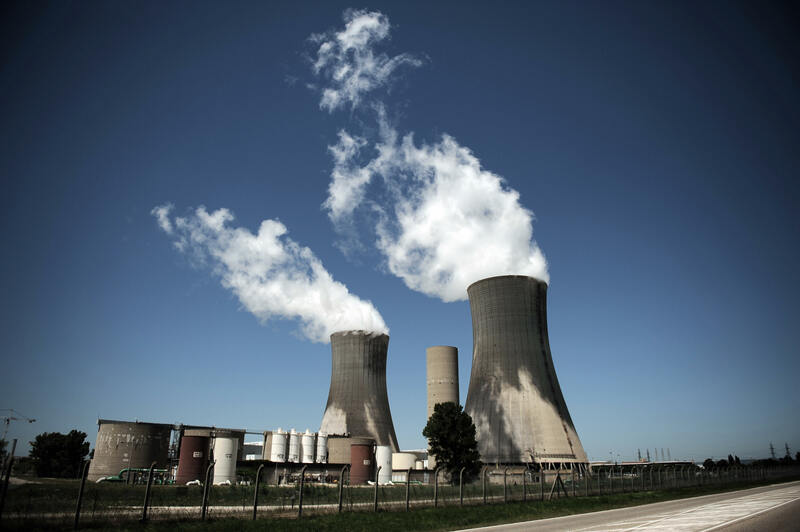 The 1979 near-meltdown at Three Mile Island, Pennsylvania put the chill on the industry, and the disaster at the Soviet reactor in Chernobyl, Ukraine seven years later brought on the deep freeze. Nuclear advocates didn't help their cause by acting like the shark-denying mayor of Amity Island in the movie "Jaws." No new reactor orders were placed in the U.S. for three decades. But the permit requests are trickling in, and in this election season, the candidates are hopping aboard the nukewagon: Obamas cautiously supports new licensing (his home state of Illinois hosts eleven reactors, more than any other state). McCain gets more specific, targeting 45 new reactors by the year 2030 - a goal many say is unrealistic. With the industry in cold shutdown and steel manufacturing pulling up stakes in the U.S., we don't make reactors any more, and would have to wait in a long, long line to order reactor vessels from the steelworks in Japan. The nuke industry's arguments are piling up: Thirty years of relatively safe operation with no major incidents; improving technology; and a measure of liberation from fossil fuels, imports, and greenhouse-gas emissions. Its public front is now a lot more polished than back in the Mayor-from-"Jaws" days, and they're much better positioned to argue against nuclear opponents, some of whom are falling back on hidebound, reactionary, dubious arguments. The industry still has no answers to ensure safe storage of nuclear waste, potentially dangerous for thousands of years. Britain and France reprocess spent fuel and re-use the recoverable material, but the reprocessing facilities at Sellafield, UK and La Hague, France have left a messy environmental legacy. For the U.S., the designated site is Yucca Mountain, Nevada. Overruns at the Yucca Mountain site are measured in the billions, and the delays are into the decades, with commercial nukes continuing to store their own waste on site across the country. And the desert site north of Las Vegas has a powerful home-state foe in Senate Majority Leader Harry Reid, so there's little chance of action there soon. The world is a more dangerous place than it was 30 years ago. Spreading nuclear fuel always leaves the risk of spreading nuclear weapons to those who would be eager to use them. Also, many nuclear arguments overlook the continuing, shameful legacy of uranium mining. Los Angeles Times reporter Judy Pasternak did a remarkable series of stories last year on the widespread damage to human health and the environment in the US Southwest last year. So what's your take? Is it a fair trade to swap the risks for a weapon against global warming and an increase in electrical capacity? Or are nukes still too hot and costly to revive? Why does John McCain think that nuclear power can replace oil? How are we going to run our cars on nuclear power? NO one has mentioned Pebble Bed Reactors. They are safe, they are mondo-efficient, and they are incredibly durable. They also can be built to scale. And as for the story on mining uranium, that's a canard. The pits are closing due to lack of demand, not lack of supply. What is it – one pellet is worth something like 80 barrels of oil, with no Co2 emissions? Talk about Build Here, Build Now. We need this stuff if we're going to be competitive. Nuclear, hydro and wind I feel are the best choices for american electricity. While Nuclear does have its dangers, mainly it's waste, it still provides a huge amount of clean cheap electricity. The tech is there to make it safe, but I'm still parinoid over the waste more then the plant itself. Hydro is something that always proved useful when the enviroment is taken into proper consideration but has the limits of needing to be where there is a large enough river and for someplaces that isn't much of an option. Wind is my Safe pick. Its one of the few structures that i've seen that is not only functional but has an elecence to it along the country side. And while solar tech my be getting better the fact stands that it is still one of the most expensive energy sources (hardware wise) and had natural limitations such as night and cloud cover. Wind is superior and takes up little space in comparison. to me it isn't a far step to seeing them being put anywhere across the nation with enough wind to act first as a suppliment source of power until either the nuclear plant issues are better met with or until something more practical for america is figured out. With enough planning counties could supply thier own green power. In the debate of nuclear vs 'other' ... do we know how many people have died in mining accidents and in the transportation of the coal from the mines to the power plants. More or less than those involved with the mining and processing of uranium and the nuclear accidents associated with the nuclear power industry? Probably should include those who have died from 'Black lung' too. Should we include those who died in the landslides in coal country?? Maybe a chart showing the distribution of the number who died supporting each industry could be done for the period of time from 1950 to present. Might help to better understand the actual risk rather than succumb to the fears associated with nuclear vs CO2. I like the idea of solar and wind. Maybe solar and wind could be co-located so they offset each others shortcomings. Might not need to have natural gas or diesel generators to back-up either solar/wind when they need to go off line due to lack of wind, nighttime and other more subtle reasons that work against solar and wind generation. Ultimately, we will drive electric cars, use electricity to heat our homes. It is the only reasonable way to distribute energy to multiple locations. Natural gas can be easily distributed by pipeline but is not universally available throughout the North America as is electricity. I recall visiting my uncle's home when they used kerosene lamps with wicks to light their farm home. They then moved to mantle lanterns with white gas, which was a significant improvement (you could actually see to read a book, play checkers/chess in the evening). Electric lighting arriving through the REA program changed their lives for the better. I don't think anyone wants to go back to that way of life... I presume the rest of the world would like to have electric power available so they too don't have to go to bed when the sun goes down at night! How do we solve that problem?? Continue to call each other names??? That is productive! Nuclear power makes (and has made) perfect sense. Once fuel, a reactor can operate for 18 months making litte more waste (volume) than an average size room. A coal fired plant, which releases more radioactivity to the environment in one day than a nuke plant does all year, uses 240 railroad box cars of coal PER DAY. Add in all the other emissions and greenhouse gases, it amazes we that we are not more dependent on nuclear power. Especially with the new generation of reactors that are 30 to 100 times safer than the ones in operation today. As for Yucca mountain, we should make it a monitored, retrievable storage facility instead of a bury it and forget it facility. After all, who can predict what will happen a 100 years from now, much less 10,000 years? It can use cheaper fuel (thorium instead of enriched uranium), the plants are cheaper to build (no need for a 30 foot thick concrete containment vessel), is already melted, so there is no 'China Syndrome' to worry about, the 'waste' decays to be less radioactive than the source ore in 300 years and can be as much as 40% more efficient at converting heat to electricity. Rather than using solid fuel pellets, the fuel is mixed in such a way that it is molten as it flows through the reactor. Because the fuel is a fluid at ambient pressure (it actually is slightly more efficient at less than ambient pressure) there is no need for the massive containment vessel so integral to the current paradigm. Since the reactor is designed to deal with the molten fuel, it naturally is capable of dealing with that level of heat. In the unlikely event that it did overheat (by its nature, the nuclear reactions actually decrease as the temperature increases), the reactor is designed so that the fuel melts out the bottom of the reactor into a containment vessel. Due to the fluid nature of the fuel it is straightforward to reprocess the fuel constantly and remove the portions that would negatively impact the reactor efficiency. Conventional solid core reactors have to make many tradeoffs in efficiency to maximize the intervals between taking the reactor down to rebuild the core. That is eliminated in the molten salt core reactor as the fuel is constantly cycling in and out of the core. As such, most of the stuff that the US taxpayer is being asked to spend billions sticking in a Nevada mountain can be used as the perfectly acceptable fuel that it is instead. Thus, most of the fuel is 'burnt' including the waste, leaving material that rapidly (300 vs. 50,000 years) decays to the point it is less radioactive than the ore it came from. The dramatic increase in efficiency when engineers are typically hard pressed to improve by 1%? Because the core is hotter a different thermal cycle can be used which is known to be able to convert as much as 50% of the heat energy into electricity (recall that current plants work at around 35% efficiency). Done correctly, nuclear power is both safe and clean. It isn't high technology either. New designs are relatively simple and fail safe. I agree with Kevin that it is about time. Nuclear power may very well be our fastest, cheapest, and cleanest way to energy independence. I worked at a nuclear power plant construction site, and have mixed feelings about them, but, generally, they are a good alternative to fossil fuel, at least for now. The plants could be built underground to minimize the chances of leaks into the atmosphere, and problems could be lessened by having it all buried to begin with. As far as getting rid of the waste, can it be a payloads onboard rockets launched toward the sun? The material and rocket would burn up before it got to the sun anyway, so why keep it on earth? Build more nuclear plants. Solve nuclear “waste” problem without reprocessing by using deep burn technologies. Nuclear power is the greenest way to boost baseload capacity. Fuel rods from existing nuclear plants can be used again in Canadian-style CANDU reactors, without chemical or heat reprocessing. Ship them to Canada as fuel or build CANDU plants onsite at existing nuclear sites to burn the used fuel (DUPIC process). Develop and build molten salt thorium reactors (LFTRs). These reactors basically burn their own waste, leaving no long-lived nuclear byproducts. In addition, they generate industrial-grade process heat that can replace many uses of natural gas, and also can efficiently generate hydrogen. you guys dont realize that nuclear power has become extremely safe the problem at Chernobyl was for the most part a human error now we have safeguards against things like what happened at chernobyl the odds of something going wrong and us having another chernobyl are a billion to one and then odds are we could get it fixed before it became irreversible and if we were to use nuclear power we could get 90% of our power and we could get the rest from clean energy like solar wind etc. Do the words "Three Mile Island" and "Chernyobyl" mean nothing??!! No, thanks. Not in MY back yard. From Wikipedia: "Current economic uranium resources will last for over 100 years at current consumption rates, while it is expected there is twice that amount awaiting discovery. With reprocessing and recycling, the reserves are good for thousands of years." It blows my mind that the environmental nuts shun nuclear energy. It should be their dream. Wind and solar will not be able to power this country. They are not BASE LOAD power sources. The wind doesn't always blow and the sun doesn't always shine. We should use them as much as we can, but nuclear is what we need to replace our coal fired plants. I understand the fears we all have because of Old Nuclear legacy but we should open our ears and eyes to the New Nuclear options. they should be putting money into researching nuclear fusion, rather than wasting so much of it on nuclear fission plants. even if they were able to convert the potentially existing fission plants into fusion plants later on, the money could be better utilized by spending it on research right now. Nuclear power has advanced quite a bit since the 1950s, and many of the fears people havee against it are irrational and based on too many bad movies. Three Mile Island is regarded as the second worst nuclear accident in history, and it has zero casualties. Compare that saftey record with anyt other power generation. One cubic meter of waste (regardless of how scary the weight numbers look) per megawatt per year is far better than coal or gas. Also, solar cell manufacturing isn't exactly the cleanest thing in the world. We should not have abandoned the technology. Why do we never look north for technology? Canadian built Candu reactors run on very low grade uranium. They are still being built all over the world and our security relationship with Canada is excellent! With the ecological disaster that fossil fuels have produced, ie Global Warming/Pollution, and the current safety record of all US Nuclear Power Plants, as well as its Nuclear Powered Naval Vessels, Environmental Activists are left without a logical leg to stand on arguing against Nuclear Power. Wind/Solar power are great for specific areas in the Midwest, but for raw reliable power output in an affordable compact package, that can be built anywhere, nothing beats Nuclear. Hydrogen: The problem with hydrogen is that it (H2) is not available. yes H20 is, but that's not the same. In order to get H2 from water, you need to raise the molecular energies to release the oxygen molecule either with electricity (electrolosis) or radiation (the burning saltwater that the ignorant media hyped). In order to get H2 you are still putting in energy in the form of electricity or radiation ( generated via electricity), and because newton's laws (energy balance) and energy losses to the environment, you are better off just putting that electricity into a battery in a electric car. The problem is very fundamental... you can only create energy (from mass) via nuclear power, E=mc2. Everything else, is converting energy from one form to another (chemical: H2 & gas, Electical, Thermal, or radiation). And in converting energy from one form to another, you are going to have losses. I don't like the problems with nuclear waste, but nuclear is the obvious choice that's available if you want to replace fossil fuels in the next 30 years. Hopefully in the next century, space travel will become reliable enough to dispose of the waste into the sun. I'll have a nuclear power plant in my backyard. Better then an oil power plant or a coal power plant. Low risk of nuclear meltdown compared to coal soot everywhere? No contest. I'll also put a windmill in my backyard and solar panels on my roof. If I'm going to use electricity, I'm not going to whine about how its made. Don't like nuclear power? Go live in a tent in the woods. Electricity has a cost. Job #1: Get off of oil. Foreign *and* domestic oil. The problem isn't the price, it's the pollution. Job #2: Switch from fission to fusion, as stated above. Not gonna run out of hydrogen anytime ever. Job #3: Find a better solution for nuclear waste than "put it in a hole in the ground and hope nothing bad happens". Maybe run it up a space elevator and shoot it into the sun? We need to get off oil, and part of that is generating a whole lot of electricity. Movement requires power, whether its electric cars, maglev trains, electric buses, natural gas powered buses, etc. That electricity has to come from somewhere, and if it comes from coal-burning or oil-burning power plants, we're just robbing Peter to power Paul. Wind, solar, hydro, and geothermal power generation are all important and should be researched and developed and improved upon. Maybe someday we can move from nuclear to 100% sustainable energy. The problem is that we need nuclear as the step between the two. I get SO tired of the hype coming from people like the reporter in LA. I have worked in the "nuke" industry for almost 30 years now. This includes working around waste processing. There is not enough room here for all the education I would like to give, so some high points. Those of us who work closest to it do not have higher occurrances of cancer than those in any other industry. Spend a little time looking at the number of people killed or injured in the mining, processing and shipping of urainium fuel and you will find it about the same as producing wind or solar energy. The waste produced from an normal power rector is of absolutely NO value to a terrorist. Yes, some waste has a long half life, but one of the waste products from ANY coal powered plant is sulfuric acid which has NO half life – it will be with us forever. Wind power has already been shown to have damaging effects on wildlife and is pollution of the skyline in its greatest form. You can go to solar, but the technology to produce enough energy to keep a small town in electricity does not exist yet and won't for decades. They are working on some wonderful and exciting possibilities for solar, but the cost triples what it costs to produce nuclear power. These numbers are what are required to meet the needs today and do not even come close to what will be needed if we begin to convert homes and vehicles away from oil as a power source. I wish there was more room and time to educate. Energy producution – any energy production has dangers and anyone who says there is anything such as "safe" energy is a fool. Americans need to stop being afraid of the anti-nuke hype and become informed. Anti-nukes use alot of fuzzy logic to keep you afraid. Example: Women carry checkbooks – TRUE. Prostitutes carry checkbooks – TRUE. Most prostitutes are women – TRUE. Therefore all women are prostitutes – ???? When the US grows up and stops trying to bury its nuclear waste the US will be able to have a real nuclear energy program. Yes, incidents have occurred and people and the environment were destroyed. So what we all need is the facts around the technology and construction techniques that make nuclear power more safe than in the '60's. I believe it's possible- just look at all the other industrialized countries in the world. But just being fearful because of the word 'nuclear' is silly and naive. Let's all look at the problem as scientists and not as emotional cry babies. _"Do the words “Three Mile Island” and “Chernyobyl” mean nothing??!! It is this sort of irrational fear and fearmongering that has prevented nuclear power plants from being built the last several decades – part of the reason we are still so dependent on oil from foreign countries. The bottom line to this (and you can check the facts yourself) is that nuclear power is cheap, plentiful, and could potentially be safe if the laws in the US were changed. On the planet Earth, we have currently enough uranium to power the entire planet at current energy consumption rates for approximately the lifetime of the sun. This is true if, and only if, we make use of emerging fast breeder reactors (look it up) which have been proven to work in Russia. But what about nuclear waste, you say? Nuclear waste is a major problem in the USA, and it will continue to be a major problem in the USA until we actually start reprocessing spent fuel on a mass scale. The fact is that it is physically possible to recover about 95 percent of spent nuclear fuel and reuse it if breeder reactors are used, but waste is still being stored in Nevada where it will continue to be radioactive for possibly thousands of years. With proper reprocessing, thousands of years could be reduced to be anywhere from 1 year to a couple hundred years (still a long time but vastly more manageable) . Look up "pebble bed reactor" - interesting concept; uses helium gas as the coolant/heat transference medium ... helium by it's very nature can't become radioactive. In the event of a reactor breach, no radioactive steam escapes. The fissile material is teeny-tiny, covered in graphite ... acts as a moderator, keeps the fissile material from running amok. Neat stuff. Until it can be proven that we can effectively deal with nuclear waste (which does not mean storing it in the ground somewhere) and that nuclear power is not a giant security risk, I give it an unequivocal thumbs down. There ARE other solutions to our energy problems that don't involve trading one environmental disaster for another - we just have to find them. I have no doubt that we can find these better solutions if the proper investment is made. "With the industry in cold shutdown and steel manufacturing pulling up stakes in the U.S., we don’t make reactors any more, and would have to wait in a long, long line to order reactor vessels from the steelworks in Japan." We all know what they were doing, back when the representatives were padding their pockets. Shut down the steel manufacturing in this country in favor of lowering tarrifs so other countries can bring it in cheaper for the profits of CEO's? You don't have to be a genious to figure out what they were playing at, and the rest of us pay. Building nuclear power plants costs us too much for thousands of year due to the waste. If they could find a way to dispose of the waste in an enviromentally friendly manner then maybe. Do we really want the waste polluting the earth for our children and thier children? We already have enough power to nearly eliminate the need for oil, once we solve the power storage problem. Don't shortchange efficiency when you consider these topics. Overall, we use about twice as much energy to run buildings as we use for transportation. We have the means at hand to cut building energy consumption by half, in the short term. If we adopt the best available conservation techniques for buildings, we free up more than sufficient power to support electric vehicles. Adoption of renewable power generation technologies is important, but adoption of the best in power conservation techniques, combined with renewable power generation, will enable us to meet our power needs and retire some of our worst-polluting power generation facilities at the same time. The internal combustion engine is between 25% and 35% efficient; electric motors are 85%-90% efficient. Even if we base power generation on coal, moving to electric transportation will reduce net CO2 emissions, simply due to the superior efficiency of electricity over the internal combustion engine. The push to move to compressed natural gas as an internal combustion fuel is a baby step, but is also not to be dismissed as a step along the way. CNG produces only about half the CO2 emissions oil-based hydrocarbons generate. It fails to address the fundamental inefficiency of internal combustion, but it's a small improvement over the status quo. I think nuclear should be a part of the whole energy mix. I think we can't eliminate any energy alternative at this point. Solar and wind will play a part, but it relies too much on the weather to be everything that we use. Coal is half of the energy mix now, mostly because it is cheap. We are not running out of uranium. if we ever are, there is an easy solution – recycle. Take the spent fuel, reprocess it. This reduces the amount of new uranium to be mined, and gets rid of over 90% of the spent fuel. This isn't new technology. The French reprocess for all of Europe. They don't have a proliferation problem – they just put the plutonium back in the reactors. As Lindsey Graham said "Surely we can be as bold as the French." Nuclear power has had an enviable safety and economic record here in the US. We have the best environmental safeguards and the best nuclear security safeguards in the world. Nuclear power is the only viable option for new baseload electric power this century. Nuclear power is the only viable electric power source that can simultaneously help free us from imported oil, significantly reduce greenhouse gas emmissions and provide baseload electric power for an expanding economy. Nuclear fuel reprocessing expands the supply of fuel from our wasteful once thru system now in use and reduces the waste storage problem (Yucca Mountain) by a factor of 20. Without fuel reprocessing we will need at least three waste repositories the size of Yucca Montain for the nuclear plants now in existence.The time to build new nuclear plants is now while we can still afford to do it. A strong and growing domestic nuclear power industry will provide 100s of thousnads of excellent American high paying jobs in plant construction, plant operation, high tech nuclear component manufacturing and nuclear fuel processing. This article is typical of those who rant against nuclear energy without knowing anything about it. The statement made in your article is the proof: "The world is a more dangerous place than it was 30 years ago. Spreading nuclear fuel always leaves the risk of spreading nuclear weapons to those who would be eager to use them." The implication is that someone just steals nuclear fuel from nuclear power plant and can use it directly for the purposes of an atomic weapon. This is completely false, The fuel coming from a nuclear powewr cannot be directly used to make a bomb. It has to be further processed by a nuclear facility that is designed to turn uranium into a weapons grade product. It appears to be the same ole story. Use a little bit of real knowledge, mix well with paranoia, add a little deception and a lot of political hogwash, and you can "influence" the voters ! I think a lot more care should be given by the powers that be which allow you to write such stuff before it gets on the Internet and confuses people. No one has ever died from an accident at a nuclear power plant in the US. In the last ten years, more than 10,000 miners (that is NOT a typo!) have died of coal worker's pneumoconiosis, or 'black lung'. See the July 2007 Morbidity and Mortality Weekly Report published by the CDC. The waste should be sequestered at Yucca Mountain. Hey, we're still finding undistirubed Egyptian graves from 3000 years ago that were never well protected. Given the safeguards that Yucca will have, I'm not worried about it, nor are my in-laws in Las Vegas! Not Safe (while I agree it is safer now – it is not safe enough) And if it is safe enough why not household or neighborhood nuclear power plants like the ones John McCain refers to on Naval subs. Why not because it is not safe enough. Not an energy solution – PERIOD. Kevin/Joe/Bob and others who advocate only renewable sources, look at the facts. the efficiency of those sources is far from what is needed in this country. Someone mentioned puting solar panels and windmills on skyscrapers, that is great to power the top floor or two...but how do you power the other 20,30 or more floors. Nuclear power is safe and efficient, the cost of building plants would come down quickly if we could build a standard design get it approved and then construct 50 or 100 of them across the country. I have been to the southern california desert, seen the acres and acres of windmills, while not ugly , not exactly attractive either. Can you imagine central park , yellowstone or other land covered with thousands of windmills. The environmentalist would be outraged. Support for Nuclear power has never been higher, let's make sure we hold both candidates to their promises of support also and all of our senators and congressman, let's get the politics out of it and lets build, build, build. There was very little if any debate on nuclear or coal during the primary. Done intentionally and most Dems seem to forget this. So there isn't any support for nuclear. Only ignorance. If efficiency is what Chris thinks is so important how do you expect that anyone would agree with you? It is too costly for investors to go it alone. What is so efficient in storing and keeping secure radioactive waste? Well of course have your kids pay for it with any benefit to them. There are too many other things to mention. We could conserve our way out of this mess and develop more efficient buildings and homes before we need to build more nuclear power plants. BTW USA produces the most nuclear energy than any other country. France is a socialist country that subsidizes nuclear power for its socialist citizens to use. And republians ant to be more like France. Come on it the next bailout for the Energy companies if we do go nuclear. I for one want to stay independent when it comes to my energy use. If you like nuclear – move and live in France. we still have chlorine gas and other ultrahazardous cargoes by rail and truck going through all 60 US target cities. Perhaps nuclear proponents think that somehow US foreign and economic policy and actions will change decisively into benevolence towards the oil-rich nations we are fatally dependent on, so we can relax about terrorism ? If not, imagine how reckless it would be to have DOE's planned 30-to-50 year shipment program of nuclear waste casks lumbering very visibly across the US, moving "mostly by rail", the US Department of Energy says, on "a suite of routes" through the major heartland target cities. DOE has already done field tests showing that a shaped explosive can blow through the casks, and future terrorist are no doubt honing their skills on our military Humvees and other armored vehicles in Iraq and Afghanistan. As for an Eastern version of Yucca Mountain, the only suitable geology I vaguely recall from the earlier nationwide search was Vermont or Minnesota granite or Mississippi salt domes. Still would entail very long shipment routes... No nation has "solved" the nuclear waste problem, and good luck getting investors to take a chance on nuclear in the near future. Two points that everyone does not consider in this debate. They are: One, all of us in the USA demand that electricity be at our finger tips whenever we ask for it. That requirement is called base load. Solar and wind cannot do that. Only coal, gas, oil, hydro, or nuclear can do the job. Second, the largest danger from burning coal, oil or gas is that the released carbondioxide eventually will be taken up by the oceans. As the ocean takes up the carbondioxide, carbonic acid is formed. Carbonic acid will and is changing the ph of the oceans. As the ph changes to acid from base most of the organisms in the ocean will die. Is that what we want to leave to our kids? The anti-nuclear comments made here are all too typical – exaggerate the dangers of nuclear and minimize the issues with wind/solar/geothermal/wave. The fact of the matter is that nuclear is safe, much more so than any other power source. The other fact here is that all of the alternative energy sources have very significant technological issues which must be solved before they can be anything other than a minor contributor. Look at France. The only realistic solution to the clean energy requirement is nuclear. Because compared to the other so called alternative energy sources like wind or solar it has the necessary power density: Nuclear reactors can generate huge amounts of power in a relatively limited space. Just think how many wind turbines are needed to generate the same amount of power like a reactor. Not to speak that wind or solar is not a steady source. And regarding the storage of the spent fuel rods: Encased in steel concrete they can be stored safely for decades. Upon the use of a nuclear rod only 10% is used, yet in the united states the whole rod is discarded, rather than simply the 10% used and reuse the remaining 90%. I'm a huge proponent of nuclear energy for one main reason: No documented domestic deaths. Yes there was three mile island, however what happened? The reactor began to overheat and the plant did what it had documented and legally approved to do, it let off a legal amount of radioactive steam. Now what were the environmental ramifications? I personally do not know, however can coal boast that no person has died in a coal mine in the past 5 years? Recent news articles would say yes, deaths have occured. I hope that our politicians will see coal as what it is, a reliable energy source that can and is safe, reliable, and cost effective. 1)We have spent over $15 billion dollars on hot fusion, a process to duplicate conditions of the interior of the sun and extract energy in the process. This process has yet to generate even one kilowatt of electricity after research spanning 30 years. If the $15 billion starting 30 years ago, had been spent on improving wind, solar, and geothermal energy technology, more fuel efficient cars, conservation, green technology, an infrastructure to promote the use of natural gas, cellulosic biofuels and other new energy technologies, we would have energy independence today. Tritium, one of the two key fuels to run the reactors, costs as much as burning one carat diamond rings for fuel. There is even talk of strip mining the moon to get the fuel for hot fusion reactors! 2)Hot fusion physicists at MIT shut down any government sponsored research into cold fusion, now called Low Energy Nuclear Reactions (LENR). The status of LENR technology today is that inventors get excess heat, reliably on demand, in a short period of time. They also get high energy alpha particles emited by their experimental apparatus i.e. not chemical. There is vast scientific evidence in support of LENR, but MIT scientists shut down the patent office to American inventors, so they have to go overseas to get patents. It is possible to get patents for cold fusion inventions in France, Italy, Israel, South Korea and Japan, but until very recently, not in America, thanks to MIT physicists. If, as MIT physicists maintained that LENR research aka cold fusion was indeed "pathological science", the worst that would have happened was that the patent office might have patented a few perpetual motion machines. If they are wrong about LENR research (and they clearly are), they may have cost America billions of dollars in lost patent revenues. The third way that MIT scientists have worked against our energy independence is that they persuaded Senator John Kerry, Democrat from Massachusetts, to shut down the integral fast reactor program (IFR-See the last paragraph, Wikipedia, Integral Fast Reactor. It was Hazel O'leary and John Kerry who shut down the program in 1994 ostensibly because of its threat to nuclear non proliferation. This is a smoke screen. The real reason is that it would have put the MIT hot fusion program out of business). The IFR technology competed directly with the hot fusion program at MIT. If the IFR program had proceeded, the hot fusion program at MIT would be superfluous, and the program would have been shut down. MIT scientists stood to lose billions of dollars in research grants. Read the website by George S. Stanford on the IFR. The unseemly rush to shut down the program is evinced by the fact, according to Stanford, that completing the research cost no more than shutting the program down. Physicists at MIT gave the technology to the French who are pursuing the IFR design and calling it one version of their Generation 4 reactors. They hope to have their Generation 4 reactors on line within 20 years. 1)It can't melt down. Scientists deprived the reactor of any electricity i.e. the control rods didn't move, the coolant pumps were shut down and the reactor was allowed to "cook". It went subcritical, shut itself down, and the passive sodium bath cooled off the reactor without incident. 2)It consumes its own waste. The IFR can burn up any elements with an atomic number above 89 i.e. any actinides e.g. uranium, etc. It can also consume all man made elements such as plutonium. 3)It is 100 times as efficient at extracting energy from the fuel i.e. existing light water reactors only burn 1 % of the energy in the fuel. The IFR burns 99.5% of all the usable energy in the fuel. The light water reactors create vast amounts of radioactive wastes. This waste could be burned up in the IFR. 4)As a result of "3" above, Yucca Mountain would be unnecessary. 5)It can consume all special nuclear materials e.g. plutonium from decommissioned nuclear warheads. All weapons grade plutonium would be consumed first and then reactor grade material next. This would be a great deterrent to the threat of terrorism by providing a sink for all special nuclear material. The CIA could compete with anyone trying to divert special nuclear elsewhere, simply by outbidding them. With the IFR, nuclear material goes in but never comes out. 6)Less radiation is emited by an IFR than a coal fired plant. In fact, one could not even license a coal fired plant with the guidelines used for nuclear plants because they would exceed the allowable emissions. 7)We could, with a 2000-5000 gigawatt reactor farm(s) on the Hudson Bay region, go carbon free throughout North America by 2100. All carbon based fuels could be replaced by electricity within 100 years. The electricity would be shipped from the Hudson Bay region south using high temperature superconductivity technology which is advancing rapidly. This requires the creation of installed capacity at the rate of 20,000-50,000 mW/year over 100 years. 8)We could generate all the energy we need from this complex, and, in the bargain, decommission all fossil fuel plants and decommission all old light water reactors. 5)A multibillion dollar hazmat team would deal with any leakage from any plant. There is no significant technological hurdle(s) to going carbon free using IFR technology or the Generation 4 technology of the French. It is just a matter of vision and logistics. "Unlike today's single purpose power plants that produce only electricity, . .. . in combination with liquid fuels and chemicals or hydrogen or industrial process heat"
Concept is combination - even lower than 3c per kilowatt hour ? 99.5% particulate capture - some fertilizer and nuclear fuel. 99.9995% possible ? Can you get below natural air quality levels ? An air cleaner, can become, a Clean Coal Power Plant ? Win either way – power or reduce the Global Population. What extra nuclear cost, above the 3c, out of Green pockets. I am a huge proponent of nuclear power for many of the reasons stated in this article as well as in the comments. Nuclear power in the US has an excellent track record. It would also be advantageous for the US to start building reactors once again. Not only could we then build our own plants rather than wait years for them, but we could also help build for other countries as well. China and India's emissions pose the largest problem. With populations three times the size of the US, it won't be long before they are producing far more pollution. It would benefit the entire world to help them enter the nuclear age as well. I understand the fears of nuclear falling into the wrong hands, but that would also open up the possibility for the US to provide security and hazmat services to those countries we sell reactors to, thus boosting our GDP even more. However, I also believe that we should be looking into more hydro solutions, as they provide some of the most energy per station, as well as limited environmental effects. True, the damming of a river can destroy a small habitat, but supposing we pick sites correctly, we can avoid doing anything that would be too extreme. The fact of the matter is that the flooding of up to 100 square miles of land would be well worth the benefit of a decreased reliance on fossil fuels. I am a huge proponent of WIND and SOLAR power for US AND WORLD. I bet if North Africa was developed with solar collectors it would have a big impact on things, same with deserts in other parts of the world. As far as nuclear power goes, I am almost completely against it. With what we have now, we are having a hard time dealing with it. Earthquakes do not go away, and neither do maniacs who want to blow s- up. The waste products are deadly for thousands of years, and we will have to deal with that. But why make it worse? Especially when there are other SAFE methods to make power, like wind and solar, geothermal. Hydrogen fuel cells. Also we should just CUT DOWN on the amount of energy used, especially in so-called "advanced" "ist world" "cultures". I think we are super wasteful, and that is a bog part of the reason why we are in energy trouble. It's a monster. Also we need to learn from the past, (embargoes, world wars) for how to live frugally. Unfortunately it seems that we have to learn the hard way. I am also against coal and oil, but we have to use it. Question is, will they spend the money to make it safe and clean (with no bs) or will it be same ol s-. Remember coal miners who got cancer and lung disease from mining. There is no such thing as "clean" coal. I think it's election time and that's why more bs in media about "clean" coal and "clean" nuclear, what a joke. Remember Chernobyl and 3 Mile Island (among others). A revival of the U.S. nuclear industry is long overdue. We live in a society where we do not want to do without a laundry list of modern convenience's. These item's require electricity in order to function. Which means that sooner or later we will have to build power plant's. We don't want to use fossil fuel's for all of their environmental degradation. So I think a combination of renewable's and nuclear is the best all-around solution. We should be developing our wind, solar, geothermal and biofuel resource's with a vengeance. Throw in nuclear and we got what we need. I recognize however that the question's of nuclear waste disposal, possible meltdown risk's and terrorist attack on our nuclear plant's must be addressed. We should answer these question's and get on with building nuclear power plants. The Global, Coral, CO2, Zombie - Death by Carbonated Soft Drink ? More than just plant food ? improved the thinking of only a few ? I though in nuclear power is that its harmfull. Eventually it will stock up in waste, creating environmental hazards. My question is why dont we make mass soler power plants in our dessers? Oh, and Franko, what's with the word salad?? Do you even know what you're trying to say, or are you just cut and pasting from your favorite web site. Nuclear power plants require huge amounts of water, which in most places in the U.S. is in short supply, plus the cost of mining the uranium, and then storage of the spent fuel. Solar, tidal, and geothermal are the most cost effective technologies for power generation. 1) Commercially viable solar power plants using photocell technology have to have about 40% conversion efficiency to be competitive. They don't. Most solar cells are 22% efficient, about half of what's needed. (There are ones that get the 40% efficiency, but they require gallium arsenide (more toxic than plutonium!) and are literally worth their weight in gold in terms of manufacturing costs. 2) Wind power has proven to be a maintenance nightmare. Instead of one mechanical object to maintain in an enclosed environment, you have hundreds of thousands spread over the horizon. 3) Neutrons transmute steel into something else. No, neutron bombardment changes the isotopes of the elements. It does not change the actual elements to something else, nor does it change the chemical properties. Neutron bombardment does slowly change the mechanical properties of steel and other metal containment units, but then again, so does the process of exposing them to steam. 4) 4th generation breeder reactors have a nearly infinite (nearly 12,000 years at current rates of energy usage growth curves, almost 100,000 if we just stayed at current growth patterns). 6) Nuclear waste makes nuclear bombs! Nuclear fuel is enriched at about 4-6% U-238 by mass. Weapons grade is enriched to 70-80%. Low level nuclear waste from spent fuel rods is about 0.3% fissile material, and it's all low level radioactives with a long half-life, completely unusable for weaponization. How low level is the radioactive waste? Mine tailings from coal mines are of comparable radioactivity, and the radioactive output from the smokestack coal plant in operation for a year is greater than all the radiation released by 3MI, and the lead and mercury released is more dangerous than all the plutonium in all the spent fuel rods in the US. If someone can't show you the math and help you follow along (and it's all high school level math for the most part), then they're trying to scare you. "Oh, and Franko, what’s with the word salad?? Do you even know what you’re trying to say, or are you just cut and pasting from your favorite web site." Who funds the scares ? To give children climate nightmares ? Bad confuses, but people figure it out; Despite propaganda. Well first, lamest story title ever. Second, Nuclear energy is a short term solution, the waste is the problem with nuclear energy. Solar, wind, other natural methods is the best solution for now. A certain OPEC nation admitted that it will cut production because gas and oil prices in the US are falling. We need to get off oil now. There is already an infrastructure to distribute electricity to run homes and even cars. Nuclear power would be a better source of energy and fuel than gas, oil, and coal. It is good to see that at least a few people are thinking rather than reacting to mindless nonsense. Nuclear power is safe. For those who think we will have another Chernobyl in the US, do some research. We do not use reactors like that here. They did have inherent design flaws. Still, it was the operators’ actions that actually made it happen. But that is beside the point. The American people are finally waking up and realizing that the fear tactics by the uniformed or biased are only hurting our country. If we had developed nuclear (as well as research into more long term solutions) we wouldn’t be in this economic mess right now. If you don’t like nuclear – fine. Disconnect from the grid or buy your power from non-nuclear sources. But quit trying to screw the rest of us over. Feel free to read by candlelight if you want, but don’t force your agenda on the rest of us. I’ve had relatives die from coal mining related illnesses. And did you know that the steel industry has polluted our country with a lot more radioactivity than nuclear power? You want to ban steel from the US? Reprocessing would solve a lot of our waste problem. The little bit left would be of minimal concern. And the real odds of a terrorist getting this waste and making a device (even a dirty bomb) are astronomical. We are probably much more likely to get wiped out by an asteroid. Of course it is possible though. Someone just needs a lot of money, a lot of firepower, the production facilities if building a bomb, etc. Oh, don’t forget the internet instructions. And while you are at it, pick up the ones to make an artificial brain and a flying saucer. Be realistic. We live with things a lot more dangerous than nuclear power and don’t complain. But when people start having rolling brownouts/blackouts, then they gripe. True, we can be as efficient and conserve energy as much as we can, and we should. But why do we need to become more primitive just because of unfounded fear? You wouldn’t give up advanced medicine to fight cancer would you? You’d want it for your family member or yourself, right? Or maybe not, considering a lot of this is provided by nuclear reactors. Anyway, the entire nuclear power cycle is safe. Of course, there are always risks in anything. It depends on your threshold. But think about it. Do you drive daily? What’s the risk there? Perhaps you drink more alcohol than is “good” for you. Maybe you smoke? Or maybe you are over/under weight? All these have risks. Are they worth it? Is clean, efficient and safe power worth the risk? Even if it really was more expensive, it would be worth it. But the new reactors are being designed so that they are not all unique with the associated one time design costs. There are standardized designs now. They will last a long time. Plus the pipes won’t magically fall apart from neutron embrittlement. And again, with reprocessing, the waste issue mostly goes away – and will easily be manageable to any reasonable person’s satisfaction. To those against nuclear: Tell the family that can’t afford the heat this winter (oil, electric – whatever) that we shouldn’t improve our power production capability – and lower costs – by using nuclear. Freezing all the time builds character, right? Maybe the kid who can’t breath because of air pollution (from fossil fuels including domestically produced coal) and whose inhaler is no longer helping – tell him the radioactive waste that is isolated and stored safely is actually a lot worse for him. Tell the people who lost (collectively) trillions due to the economic crisis caused primarily by oil demand and the associated price hikes for crude that they are better off. (The mortgage crisis was driven by rising rates which were caused by the inflationary pressure from rising crude prices – that is the real “smoking gun.”) You do know better than all these people do, right? By the way, I doubt the election will really solve anything. The only hope we have is that intelligent people will have legitimate conversations about this and other issues and tell their representatives what they really want. And regardless of what my opinion is, or how vehement I may be, the most important thing to say – the bottom line – is that everyone should think for themselves. Don’t buy the hype or crap from any side. Use your brains! Think! And to all – please don’t try to add legitimacy to your posts by listing your degrees. There is an issue of relevance here. It is better to be anonymous. What about the fact that a coal plant releases 3 times the amount of radioactive waste into the atmosphere then a nuclear plant creates in a year. Most the waste created by the nuke plant is contained. Politically, yes they say it is okay now, but just wait till someone actually tries to develop a new plant... Lawyers, Lawyers and more Environmental Lawyers. They will effectively halt production. So lets get it over with and start into the 1,825,000 Wind Turbines needed to suplly the US with clean, free energy. We all know that 3 Years down the road our wonderful environmental lawyers will have nothing to earn a living wage upon anymore and it will be found that all those beautiful Wind Turbines are actually impacting the surrounding environment. Back to the courtroom and will will be back at the bottom of the stinking heap. People, there are ideals and then there is reality. There is no way to sustain the human race without having left a footprint on this earth. Part of me says yes to nuclear and part of me says no. The part that says no is the Chernobyl side..... humans are imperfect and make mistakes. Imagine if someone made a mistake and a city the size of Los Angeles wasn't inhabitable for hundreds of years as a result? The other side of me says to go for it because we have advanced so much with our safety systems and containment vessels. I say go for nuclear, at least until we have commercially feasible fusion reactor technology. All of these pro nuke comments seem to be like posts from a bot, same posts but slightly reworded. Nuke is not the way to go. No community in America is going to allow one to be built. In NJ, the Oyster Creek is up for renewal and the citizens will not the contract to be renewed. Even driving by that plant on the NJ Parkway is a spine tingling experience. If NJ residents won't allow it, I really cant imagine other states allowing it. What happens to the waste? Why are our solutions to "kick the can down the road" and make our children deal with our problems? And to all of you people touting the US Navy use of nuclear power... I think that is one of the most ridiculous inventions in the history of modern day warfare. Its a disaster waiting to happen. Just think about it. If the one of the subs the Nazi's sank during world was nuclear powered? What then? Nuclear waste washing up on our beautiful beaches? Waste that could never be cleaned. A nuclear disaster is more or less a permanent one. That radioactive waste is prevalent for hundreds of years. We worship science so much, yet one day if mankind survives, future generations will look back and say if they only knew... You know one of those foolish things humans did because they didn't know... like the Romans using LEAD pipes for plumbing, using Heroin as a cough medicine, DDT, asbestos,etc. But I fear nuclear is far worse. Regardless of the doom and gloom, waiting until 2030 is not a solution. Again, kicking the can down the road during which time one administration or another is bound to "reverse" the foolish legislation that approved it in the first place. We need an IMMEDIATE solution. For the same reason, domestic drilling is not a solution.. 10 years before a drop of oil is produced. Economically, nuclear doesn't make sense either. Why dump all that money into foreign products, like Japanese reactors? The cost to store the waste etc. But the promise is in solar, but not here on earth.. BUT SOLAR ENERGY FROM OUTER SPACE. you may think that that is insane, but its not. The sun always shines there and the solar energy in space in much stronger than it is on earth. Most of the entire telecommunications industry is powered by solar powered satellites. JAPAN IS ALREADY WORKING ON TECHNOLOGY TO HARVEST SOLAR ENERGY IN SPACE AND SEND IT TO EARTH USING A LASER BEAM. Space is the next frontier and putting our money into commercializing space is the solution to our economic and energy needs. Solar energy is abundant there and humans have long dreamed of colonizing distant plants, (Total Recall). Prudent would be to capture all the nuclear fuel, not let it out the flue. Save the nuclear fuel for future generations, Perhaps for space travel ? Have your energy and eat it too. Double the cash. Sell the radioactives to the French ? I hate to dissapoint you, but I am not a "bot" or a mindless individual. I can see by reading your post that you seem to be an intelligent thoughtful individual. However, I do wish you would investigate a bit further into the realities of nuclear power. I am concerned that you are basing your beliefs on propaganda rather than actual investigation. As for approving new reactors, I think you are very wrong. Perhaps it is just that I grew up in an area with a nuclear power plant and where the people were progressive and intelligent, and not simply reactive to activists. To be honest, if we had never developed nuclear weapons, but simply moved to peaceful energy production, a lot of this hype would never have surfaced. Too many people simply cannot separate nuclear weapons and nuclear power. I do not personally know a single person who has died from the "nuclear" part of a nuclear power plant in the US. I do know of people who have died from coal power generation process, hydroelectric process, etc. And I do know people who died as a result of nuclear weapons testing. Also, the vast majority of the people affected by Chernobyl – especially children – would not have been affected had the potassium iodine been handed out rather than the Soviets take time to try and cover it up. Still, a Chernobyl simply cannot happen here. Anyway, I just wish people would actually investigate and find out the facts about an issue before they make comments. Personally, I have to my satisfaction. And to those who had done their own due diligence, great! Even if we disagree. At least you are informed. I am confident that nuclear power is safe and needed. If you honestly disagree, that is what America is all about. But just know what you are talking about first. We need to realize we hurt ourselves more by burning coal which contains specks of radiation, than we would be by turning that radiation into energy and then containing it (or recycling it) when we are done using it. Remember we run about 20% off nuclear plants and 50% coal. A few oil black polar bears, or radioactive fishies ? Best way to toast sliced bread ? "No relation between consumption of nuclear toast and nuclear radiation has yet been found." Let's talk cost. Anyone know how much an average nuclear reactor costs, to design, build, and maintain? These things aren't cheap, and they take over 7 years to go from ground breaking to power distribution. Yes, building new nuclear plants quickly is of high priority. With the call ever increasing by the global warming crowd and the even MORE important issue of energy independence, we will NEED a lot more nuclear power. Increasing by a factor of 10 the number of wind farms still leaves us less than 5% of our electricity requirements. There are significant environmental concerns with Solar cells too if they are manufactured and distributed around the country in the quantities necessary to provide 50% or our energy needs – so no real easy answer there. We should use WIND, SOLAR, and NUCLEAR to reduce our reliance on oil and coal. We need to build them BEFORE we shut down coal plants or we will have electrical shortages and huge price increases resulting in many more job losses and severe damage to our economy and standard of living. We should also be investing 10billion per yr into FUSION energy research as regular nuclear energy has a much more finite supply and significantly worse environmental and weapons related concerns. Why can't we just buy the uranium from some other country? Leave the U.S. Southwest undamaged? U.S. Steel and Nucor are pulling out of the U.S? Well shipping prices are starting to fall again. If they close Yucca flats maybe we can ship the waste somewhere? How much does it cost to store it at Yucca? Can we store it on the moon or aim it at the sun? Weren't there reprocessing techniques when we had a nuclear industry to put it into inert material or re-invigorate the fuel? Obama said he will close down ALL the coal plants and mines in the U.S. Oil is most likely on the short list. That leaves just wind and solar. All the people in the U.S. Northeast may find that a challenge and a benefit as their home heating bills will have dissappeared for the winter. If we're going to go back into building nuclear power plants, please please, please, do it like the french did it. Find one design, make it the best you can, then build that one design every where. If you change one, change them all. If you train on one, you could run any. And if you want to build another one, you'll know exactly how much it will cost. renewables wind, solar, hydro, and thermal do not produce greenhouse gases or radiation risk and tap a power source which will last much longer than we will. small scale renewables can be owned and operated by individuals providing employment and profit for millions. large scale operations will pay taxes and fees to land owners and governments. as a bonus natural gas used to generate electricty can be come fuel for vehicles instead reducing the need to import oil. I'm thinking we should wait until we solve the problem of nuclear waste disposal. Also, with terrorism rampant in the world, wouldn't this create more targets? I don't know much about the possibilities of utilizing nuclear reactor as terrorist targets, but it seems like it could be a major concern. Diamond rings have been in use since the Archduke of Austria Maximilian gave Burgundy a diamond ring in 1477. Since then, it has been customary for most to propose with a diamond ring. Many who have made the step up with diamond engagement rings to show their undying love to their partner have been successful. Simply, diamonds are a girl’s best friend and they last forever too. Just as a diamond lasts forever, you also hope your love is forever.""